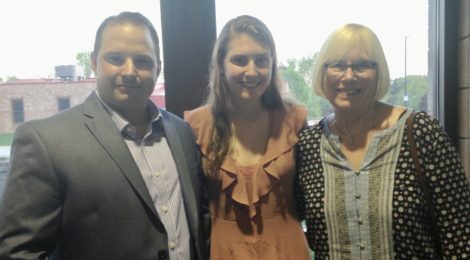 The recipient of the 2018 MAGI/Wildwood Lions Environmental Leadership Award was announced May 16 at the Mahtomedi High School Awards night. This year’s winner, Isabel Birkeland, is both an environmental and a humanitarian leader. For each of the past two years she organized and led a community “Walk for Water” to draw attention to the local and global water crisis. These events raised $8,000 to bring safe drinking water and sanitation to schools in Cambodia and Uganda through H2O for Life. Along the way, people in our area learned more about how each of us can conserve water here at home. Next year, Isabel plans on pursuing an environmental science major at the University of Minnesota. Congratulations to Isabel Birkeland, the winner of the 2018 Environmental Leadership Award. Photo: Wildwood Lions president Nick Marshall, Isabel Birkeland, and MAGI representative Jeanne Zlonis celebrate May 16.